From 24th-25th August 2017, BINUS UNIVERSITY in cooperation with other esteemed higher education institutions in Indonesia, will host the 2nd International Conference on Organisational Performance (iCOPE) 2017 seminar and conference in Bandung. In anticipation of the event, BINUS UNIVERSITY encourages participants — industry experts, entrepreneurs, educators, policy makers, and students — to submit research papers in-line with this year’s theme of Ecosystem, Innovation and Excellence in Enhancing Organisation Competitiveness and Sustainability. The accepted publications will be uploaded on SCOPUS and Thomson ISI; two renowned digital libraries that cater towards scientific and technical content. Prominent keynote speakers scheduled at the event are Dr. Ulf Henning Richter as Associate Professor of Global Business Strategy at Tongji University, China, Mr Priyantono Rudito Ph.D as Director of Human Capital Management at Telkomsel, and Chief Executive Director of Pertanika Journals at the Universiti Putra Malaysia Dr. Nayan Kanwal F.R.S.A, in addition to Prof. Dr. Harjanto Prabowo as Rector of BINUS UNIVERSITY and other rectors of Indonesian universities. iCOPE is a non-profit organisation that was established to support the overall organisational performance of entities across diverse industries. The objectives of this year’s iCOPE seminar and conference are to provide a platform to promote academic and business research outcomes that contribute to overall organisational performance excellence. To achieve this goal, participants are encouraged to efficiently integrate the topics of leadership, strategic planning, consumer and market focus, as a means of creating long-term sustainability for both private and public sectors. In hosting this event, BINUS UNIVERSITY hopes to foster innovation and creativity and inspire participants to develop the necessary technical skills in an increasingly competitive business environment. 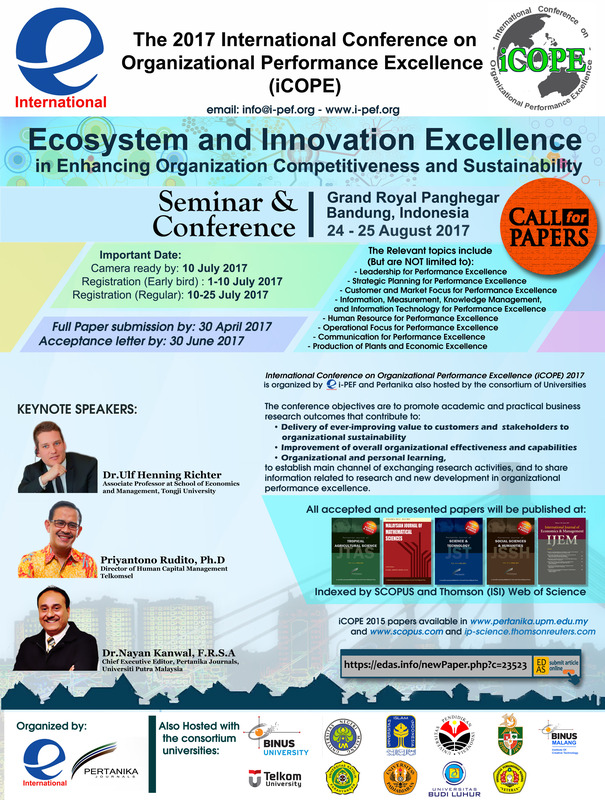 For more information about the iCOPE 2017 and the submission date for research papers, please click here. Let's Join Ishikawa Japanese Studies Program!